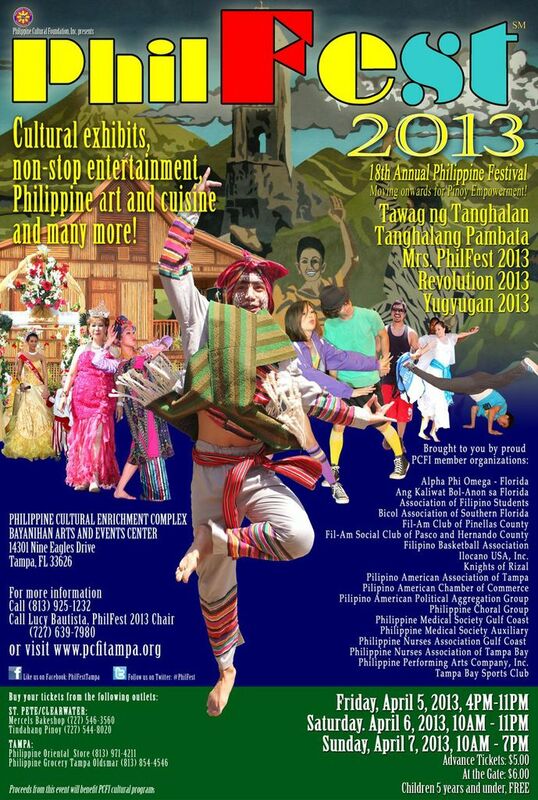 Tampa, FL, April 1st, 2013–The 18thAnnual PhilFest will occur from April 5th-7th,2013 at the Bayanihan Center Grounds (14301 Nine Eagles Dr. Tampa, FL 33626). 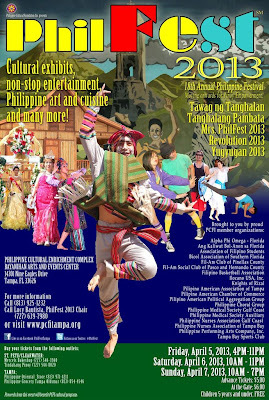 The Philippine Cultural Foundation Board of Directors, with help and volunteers from the community, try their best to provide the 12-13,000 Filipinos and Filipino-Americanswho attend PhilFest a feeling of nostalgia for the motherlandand the non-Filipinos an impressive glimpse of Philippine culture through dance, song, food, cultural exhibits, fashion shows , and colorful parades and processions.People of all ages and all walks of life coming from the Tampa Bay community and beyond take time off for a weekend of fun for everyone, delicious food and high class entertainment. PhilFest is considered to be one of the largest outdoor festivals in the country and happens only once a year. ThePhilippine Village will be transformed into a typical colorful fiesta (festival) atmosphere with numerous local and out of town vendors sell culinary offerings catering to different palates in booths decorated with colorful Philippine motifs. Merchandise vendors will be selling handicrafts, gorgeous Philippine attire, both for men and women, colorful fashion accessories, as well as different types of merchandise, both Philippine and non-Philippine. Therewill be something for everyone. Advance tickets to PhilFest are $5 and will be $6 at the gate. Children 5 and under are free. It sounds like a lot of fun and the price to attend is very family and budget friendly! Bet that was a lot of fun, I'll have to keep that in mind for next year's spring break.